Wiggle-Honda scored a one-two finish in Sunday’s Vargarda World Cup race, with Jolien D’hoore taking the win and teammate Giorgia Bronzini nabbing runner-up honors in a high-speed finish in Sweden. D’Hoore’s big day also launched her into the overall lead in the World Cup standings ahead of Elizabeth Armitstead (Boels-Dolmans), who finished a distant 19th and slid to third on the World Cup leaderboard, with Anna van der Bregen (Rabo-Liv) jumping to second after finishing fifth. After a day of attrition with one attack after another gradually whittling down the peloton, 25-year-old D’Hoore was the fastest rider in a messy, selective sprint. 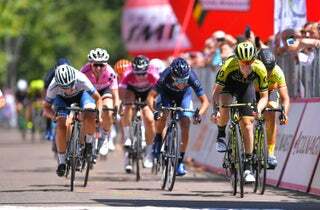 The reigning Belgian national road race champion opened her move 200 meters from the finish and held out all the way to the line to take her second World Cup win of the season. Bronzini secured second-place behind her teammate, with Lisa Brennauer (Velocio-SRAM) nabbing third. “We had a plan before the race, and everything went perfectly for us,” D’hoore said. “[Giorgia and I] were talking in the second-last lap, and she said ‘you can do your own sprint, and I will be in your wheel. If you slow down I will take over, but you can do your own sprint.’ So that’s what I did: I went from 200 meters, full gas, but really I didn’t know Giorgia was behind me; I didn’t look behind me. D’hoore’s win saw her jump three spots to take the lead in the overall World Cup standings with just one race to go. The final World Cup victory will be decided in the tenth and final race of the series, the GP Plouay-Bretagne, on Saturday, August 29, a race D’hoore was originally expecting to skip. She’ll now have to give a bit more thought as to her plans for next week.